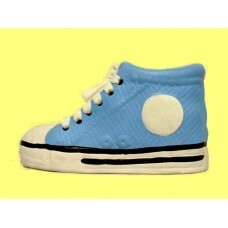 Ceramic High-Top Sneaker with real Shoelace makes saving $ Fun! INCLUDES NAME! Size: 4.5" H. x 7.75" L.--Avail. in Red, Pink, Light Blue, or Yellow. Great Big Sister or Big Brother Gift! NOTE: See #AC-21 for Ceramic Sneaker with open top for storage, such as pens, pencils, etc.